These EU and Organic eligible Angus x Poll Hereford heifers 16-17 months averaging 365kg from Boggabri NSW fetched 251c/kg or $915 this week. 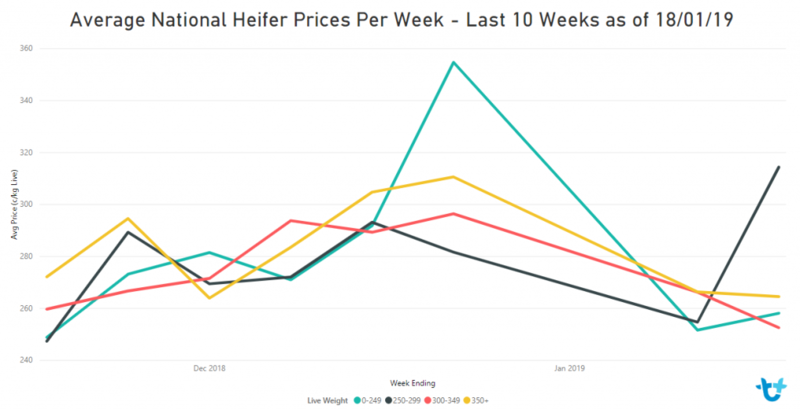 MOST lighter steer categories eased in price on AuctionsPlus this week, with clearance rates continuing to soften as vendor expectations aren’t being met by the market. With ongoing desperately dry conditions in many areas cattle numbers continued to rise, with 9196 head listed. Interest remained strong, with 465 stakeholders logging into the sales. Joined and PTIC female numbers rose to 1300 head, with prices ranging from $920 to $1750, and averaging $1429. Top price went to a line of Angus PTIC cows offered by Minto Pastoral Co Morewell, VIC. Offered in the Autumn Calving Female Feature Sale, these five-year-old cows were PTIC to Angus bulls. The same vendor also offered four other lines in the same sale. From Penshurst, VIC a line of PTIC EU-accredited Angus heifers 21-22 months made $1600. Cow and calf units saw 1218 head listed this week, achieving a 65pc clearance. Prices ranged from $625 to $1525 and averaged $1156. Top price went to a line of station-mated Angus cows & calves 40-months of age, with Wagyu-sired calves at foot, from Glenroy, NSW. From Keith, SA, 20 Angus cows with Shorthorn-sired calves at foot sold for $1500. This week’s Weaner & Yearling sale saw 5505 head listed, with prices ranging from $350 to $980 and averaging $678. Top price went to a line of Angus yearling steers, 12-16 months old averaging 340kg out of Padthaway, SA. They found a buyer in Kaniva, VIC. Another highlight came out of Boggabri, NSW where 30 EU and Organic eligible Angus x Poll Hereford heifers 16-17 months averaging 365kg fetched 251c/kg or $915. This week saw another successful Tasmanian sale, with the 606 head listed achieving a clearance of 74pc. Interaction with the sale was strong, with 62 users logging-in. Top price of $1640 went to a line of Angus x Friesian PTIC heifers from Winnaleah, North Eastern Tasmania. The heifers were 26-27 months old averaging 542kg and joined to Angus bulls. From Rolleston, Central QLD, 84 Santa x Brah yearling steers, 12-15 mths averaging 336kg made 259c/$870; while 90 lighter brothers 303kg made 260c/$788; and 72 Brahman x Santa yearling steers, 267 kg made 264c/$705.